Bananas thrive abundantly in a tropical country like the Philippines, therefore it’s quite common to find them incorporated into various Filipino dishes. Plantains and the sweeter, local variety called “saba” or “cardaba” bananas are used for example as ingredient in Filipino recipes such as the Visayan humba, nilaga or nilat-ang baboy, pochero, and this pork-stuffed fried saba known as “banana meat” –a local delicacy in my beloved hometown, Dalaguete, Cebu. 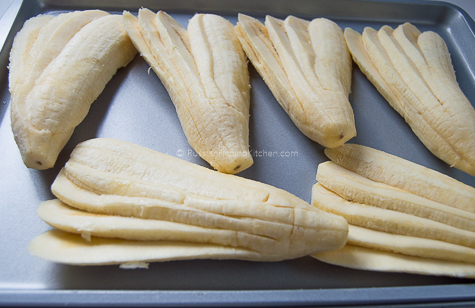 Snacks made from saba bananas are very popular among Filipinos, often sold as street food. They’re affordable and easy to prepare. The simplest method is just to boil them either ripe or unripe and they’re ready for eating with or without any dipping sauce. Saba bananas are also naturally sweet, nutritious, and packed with fibers, so they make an excellent snack food for anyone who likes to enjoy their “merienda” time. 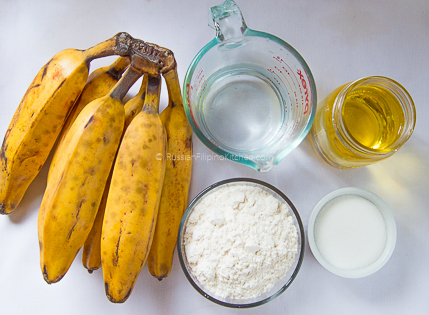 Today’s recipe is a popular banana snack known in Cebu and some parts of Mindanao. It’s called “Pinaypay na saging” or just “pinaypay” to many people. 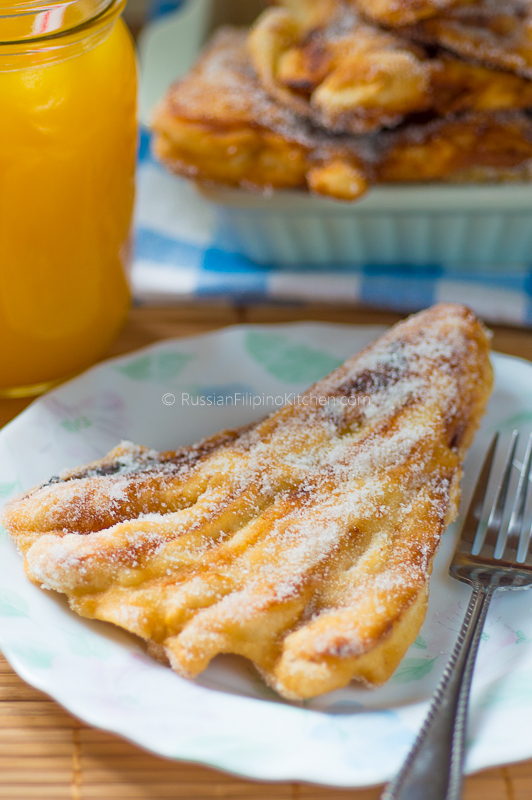 It’s simply a variation of fried banana fritters. The name literally translates to “banana shaped into a fan” due to its “fan-like” shape after it’s fried, resembling a Japanese/Chinese hand fan. 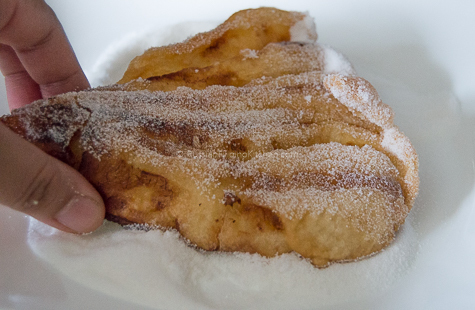 I previously posted a recipe for maruya or sliced banana fritters which is dipped in an egg-flour batter before going to the fryer. Pinaypay is similarly prepared. The only difference is frying the fruit whole with thin vertical slits/cuts but not all the way, leaving about an inch of space on the bottom. 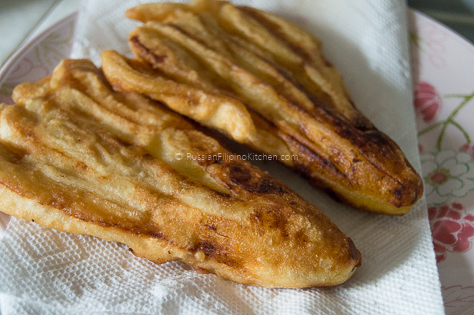 The slices are then carefully spread sidewards, dunked in the batter, then fried. The batter helps retain the shape and makes the fritters crispy. My mom used to make this many times when I was growing up; it still remains one of my favorite snacks till now. It was such a delight back then to dredge those warm fritters in an obscene amount of sugar, then licked our fingers in satisfaction after popping the last morsel into our mouths. Well, that changed a little now that I’m an adult. I try to use just a small amount of sugar in every pinaypay I make and to always shake off the excess. 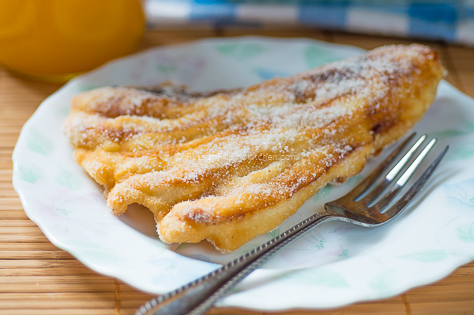 Hope you’ll try this recipe and enjoy it too! 1. Prepare the batter by mixing the flour and water in a mixing bowl until smooth. Set aside. Transfer sugar onto a plate and set that aside as well. 2. Peel bananas. Use a knife to cut 4-5 vertical slices in each banana starting from the top to bottom leaving about an inch of space on the bottom. This makes it easier for you to hold the bananas individually when you dunk them in the batter. 3. Gently and carefully spread the slices towards the side, imitating the shape of a hand fan. Carefully arrange them in a single layer on a baking tray or plate while you heat up the frying oil. 4. Heat up oil in a frying pan over medium high heat until temperature reaches 350ºF (180ºC). 5. 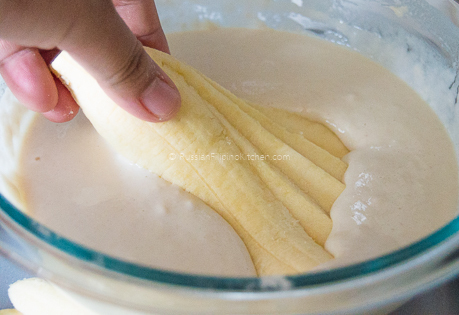 Dip banana into flour batter and coat both sides. Allow batter to drip for a second or two then carefully drop onto the hot oil. Fry until side is golden brown. Depending on the diameter of your frying pan, you may fry more than 2 pieces at a time. But in my case, I can only do two. 6. Use a turner or tong to flip the fritters over and fry the other side until golden brown as well. 7. Remove from pan and place on plate lined with paper towels to absorb excess oil. Fry up another batch until done. 8. Dredge warm pinaypay with some sugar and shake off excess. 9. Serve with beverage of choice. 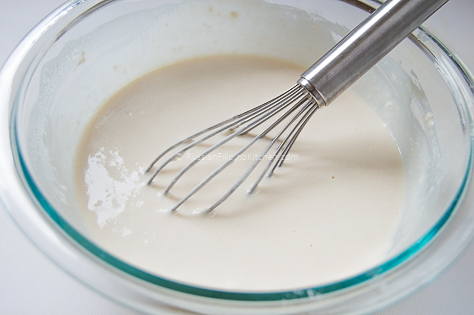 Prepare the batter by mixing the flour and water in a mixing bowl until smooth. Set aside. Transfer sugar onto a plate and set that aside as well. Peel bananas. 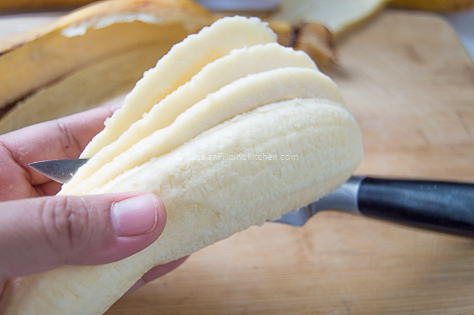 Use a knife to cut 4-5 vertical slices in each banana starting from the top to bottom leaving about an inch of space on the bottom. This makes it easier for you to hold the bananas individually when you dunk them in the batter. Gently and carefully spread the slices towards the side, imitating the shape of a hand fan. Carefully arrange them in a single layer on a baking tray or plate while you heat up the frying oil. Heat up oil in a frying pan over medium high heat until temperature reaches 350ºF (180ºC). Dip banana into flour batter and coat both sides. Allow batter to drip for a second or two then carefully drop onto the hot oil. Fry until side is golden brown. Depending on the diameter of your frying pan, you may fry more than 2 pieces at a time. But in my case, I can only do two. 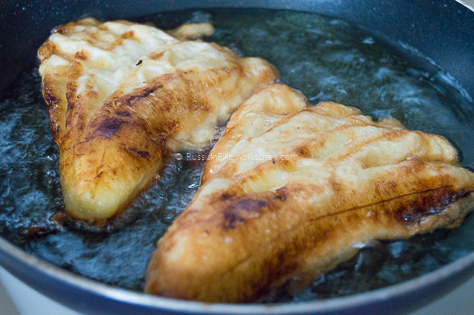 Use a turner or tong to flip the fritters over and fry the other side until golden brown as well. 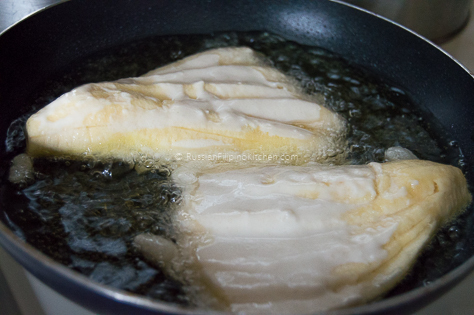 Remove from pan and place on plate lined with paper towels to absorb excess oil. Fry up another batch until done. Dredge warm pinaypay with some sugar and shake off excess. Serve with beverage of choice.